The Ohio State University Biological Sciences Greenhouse is an oasis for undergraduate, graduate and faculty research on plants and insects. Additionally, it grows plants for undergraduate classes and provides outreach to the community, particularly K-12 classes. The greenhouse facilities are absolutely essential to my research, allowing us to rear mosquitoes for experiments, record their sugar-seeking behavior on plants, and create walk-in semi-natural mesocosms to measure effects of different kinds of nectar-bearing plants on mosquito biting frequency and reproductive success. A GREEN greenhouse: whenever possible, live ”good” bugs, which are predators of “bad” bugs, are used for safe, natural pest control. 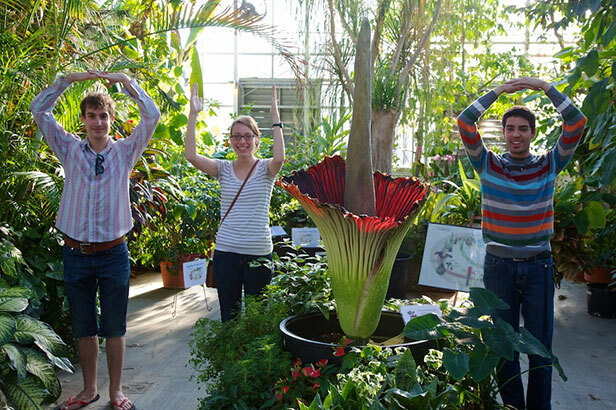 The Greenhouse made big news in April 2011 when its Titan arum, fondly known as Woody, bloomed. The Titan arum is commonly referred to as Corpse Flower, because it emits a pervasive odor of rotting meat. It has the world’s largest leaf—up to 15’ tall and the world’s largest unbranched inflorescence (flower) that can reach 9’ tall. Woody made news around the world with 75 feature stories, 40 television segments, and over 5,250 visitors lined up to see the bloom. In 2012, a second Titan Arum lovingly named Jesse bloomed. Jesse was successfully pollinated and its seeds have been dispersed to conservatories across the US, Canada and even as far away as China. Woody bloomed a second time in May 2013 along with two other specimens, Maudine and Scarlet. Maudine produced seeds. Pollen collected from our plants has been sent to multiple institutions. A biological greenhouse facility has existed at Ohio State for more than 125 years. Having an in-house facility for growing plants and rearing insects for teaching and research continues to be increasingly vital to student and faculty researchers. 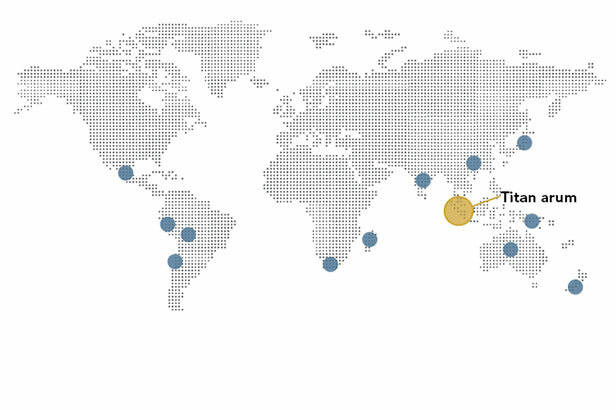 Work areas: population ecology; systematics and evolutionary biology; anatomy and developmental biology; genetics and biotechnology; physiology and toxicology; molecular biology; and integrated pest management and biological control. Current research projects include: courtship and feeding behavior in mosquitos; demography of native and non-native honeysuckle; study of genetic control of flower timing and flower formation; gene flow; and plant reproductive ecology. The greenhouse supports teaching by growing plants for undergraduate learning opportunities and providing space and materials for student-driven course projects. More than 4,000 students in classes from Art to Zoology are served annual by the facility. Drawing, ceramics, sculpture, photography and other art courses find the greenhouse a source of inspiration. The Conservatory’s tropical and desert houses exhibit a collection of more than 1200 plant species, representing nearly 120 families. This includes a Fern Palm, Cycas circinalis. Cycads, which date back to the age of dinosaurs, are an endangered species. Plants whose homes are thousands of miles away from one another — in Asia, Africa, Micronesia, Australia, New Zealand, Central, and South America — live happily side-by-side in the climate-friendly environments of the Greenhouse. Provides tours and hands-on learning opportunities for 2,000, K-12 local school groups annually.